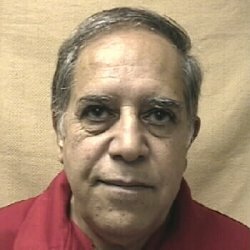 On this date in 2005, North Carolina executed 67-year-old immigrant Elias Syriani at Raleigh’s Central Prison for the murder of his wife — despite the emotional clemency intervention of the couple’s children. Syriani, an ethnic Assyrian driven from his native Jerusalem by al nakba who moved to the U.S. from Jordan through marriage to a Jordanian immigrant, had a stormy marriage hit the rocks in 1990. Teresa filed for divorce after a few years facing Elias’s violent objections to her westernized behavior. Syriani responded by jumping her when she drove home one night, and stabbed her to death with a screwdriver in front of their 10-year-old child. This case meandered forgettably through the bowels of the criminal justice system; the traumatized children moved on (.pdf). Until the year before Syriani met his fate, when the mysteries of the human heart flipped the script. The children — by then grown — became Syriani’s advocates for executive clemency, posing an unusual challenge for Gov. Mike Easley: in an environment that (rhetorically, at least) often counts on survivors’ rage and grief as arbiters of punishment, would he spare a father for killing a mother when the children said execution would redouble the family’s injury? But commutations rarely happen — there’s just no percentage in them for politicians. The following are excerpts from an interview with the film’s Producer/Director Linda Booker originally conducted by Sean O’Connell of The Charlotte Weekly. When did you first hear about/become interested in this story? At what point did you get the idea to film the story in documentary form? How long did it take to complete the film? It was an immediate reaction for me upon reading the article that their story might make a compelling documentary film. I printed it out and carried it around with me. But I was still finishing up interviews and editing my first documentary project “Millworker: the Documentary” so I didn’t act on it right away. Then several months later I learned that they would be speaking in Chapel Hill, close to where I live, and I thought, “okay, if I feel this strongly about this, here’s my chance to meet them and film their discussion.” So there I was, a relatively new filmmaker and very nervous about that first step, but I received permission to film that night. That’s also when I first heard about and met Meg Eggleston, who had been writing letters and visiting Elias Syriani on death row for four years and the Syriani sibling’s attorney Russell Sizemore, who was helping them through their father’s clemency appeal pro-bono. I came to learn that Meg’s friendship with Elias was an essential part of their father’s transformation and was such an interesting story in itself. I started filming in October 2005, edited in the fall of ’06 and started doing preview screenings in early ’07. Since then the film has screened at film festivals and many grassroots screenings with various non-profits and faith groups as sponsors in the U.S. especially in North Carolina. The Syriani children are open and honest in the film. Did you have trouble accessing them? Were they open to the idea of participating in the film, even though at this point it could not help their father? I started filming interviews with Meg Eggleston and Russell Sizemore first who trusted that I was not trying to do a sensationalized story, but that I recognized the Syriani’s story of forgiveness was inspirational, regardless of the outcome of the clemency appeal. The Syrianis knew that I was working with Meg & Russ, but out of respect for all they were going through, I did not push the issue of their participation. About six months after the appeal, I wrote them about participating and subsequently we went to California and Chicago in the summer of ’06 to film interviews with them. While they know that a part of the discussion around the film will be capital punishment, the Syriani siblings have expressed that they want their story to live on in hope that their experience of surviving a domestic violence tragedy and the healing that came from forgiveness will touch people’s hearts and help others. I think it’s because this case is so unique, but I found the film’s stance on the death penalty unclear. Can you, as the filmmaker, clarify your thoughts on the death penalty? Well, I’ll take that as a compliment, because the documentaries I admire aren’t pounding you over the head with the filmmaker’s opinion. I can tell you that making this film made me face how I felt about the death penalty and I spent a lot of time researching and doing some deep thinking about the issue. Needless to say it’s very complex, and it is completely understandable that feelings of anger and retribution can occur when you have lost a loved one to violence. We need to do more for those dealing with the aftermath of murder with as much support, assistance and counseling services as possible, especially children. But as I went to restorative justice forums and have met many people who belong to organizations such as Murder Victims Families for Reconciliation, I kept hearing stories about how the death penalty was causing more grief, stress and division in families that had experienced murder. Between making the documentary and doing the research, I came to the conclusion that I couldn’t support a system of justice that can possibly create more pain and victims in its wake and that was also irreversible and arbitrary.